Gift a peek of Winterland with sweet delights and goodies from cupboards and books. 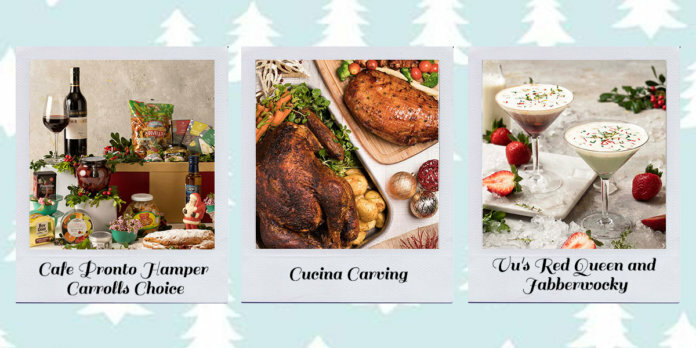 Choose from hampers Mad Hatter’s Party, Winterland Magic, and Carroll’s Choice, or choose the items for build your own set. 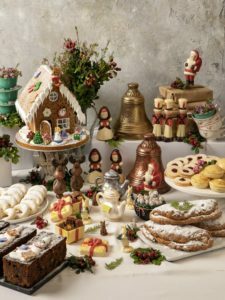 These gift sets include red wine, panettone, fusilli tricolore, artisan chocolate bars, chocolate figurines, fruit sweets, deviled ham spread, and marzipan stollen to name a few. These presents are prepared in festive hampers perfect for season of giving. Grow tall or grow short, a strange magic is paired with the month’s featured Alice Cake. 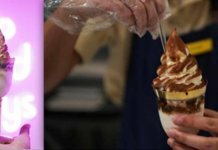 This sweet treat is made of layers of banana compote, orange sponge, milk chocolate mousse, with peanut butter crunch at the bottom. Celebrations won’t be complete without a plateful of holiday staples. Hong Kong Roast Goose and Christmas Turkey are available for takeaways. 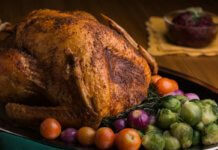 Have a grand fest for your celebrations at home with these finest roasts. A bountiful feast in a long table to share with the special ones. Savour all-time holiday bests that bring happiness to those most dear this season. Christmas Eve dinner buffet highlights a wide array of dishes such as Roast Angus Beef Rib Eye, Caramelised Ham, and Crispy Duck Breast on Mango Basil Sauce. Midnight spread includes Filipino signatures Pancit Palabok and Cebuano Pork Humba. Relish the New Year with sumptuous dishes. Eve dinner features Iberico Pork Loin with Apple Sauce, Chinese Barbecue Duck, and Gratinated Prawns, Mussels, and Salmon with Wholegrain Mustard Cream. Have a feast of Orecchiette with Pepperoni and Tomatoes and Roast Leg of Pork for New Year’s Day. Holiday rates are at Php 3,800, Php 1,800, and Php 2,888 for Christmas Eve Dinner, Noche Buena, and Day, respectively. New Year’s Eve and Day are at Php 3,800 and Php 2,888, respectively. Lung Hin’s highly-trained chefs will bring the finest Cantonese flavours with set menus for Christmas and New Year’s. 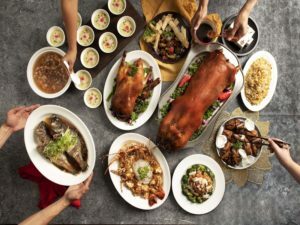 Have a taste of selected dishes including in the special set menus such as Crispy Roasted Suckling Pig, Pan-Fried Australia Wagyu Beef with Black Pepper, Stir-Fried Abalone with Fresh Scallops and Broccoli in Oyster Sauce, and Roasted Peking Duck. Have a taste of seasonal sips at the hotel lounge. Catch up with friends, or have a drink to cap off the night with Tequila Navidad, Arabican Spice, and Skylips. Don’t be late! Don’t be late! Join us as the clock ticks towards 2019! Get ready to look through the stunning skyline of the metro as you raise your teacups of bubbly champagne to a magical year. Fall down deep into a wonderful beginning of the New Year. Tables are available for reservations. Festive concoctions are about to be raised. 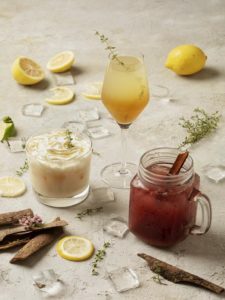 Cocktails that excite and delight with Yuletide Pears, White Christmas, and Holiday Sangria. Enjoy the Yuletide glee with cocktails Red Queen and Jabberwocky, and get the second glass, on us. For its third year, support a worthy cause to protect the Philippine Eagle for future generations. Purchase a stuffed toy at Php 650 and help in the conservation of the country’s national bird. Just as the Whimsical Winterland lights up, Santa Claus is coming in his sleigh to listen to everyone’s Christmas wishes and take snapshots with the kids who made the Nice list! Catch him one 9, 16, and 25 December at 11AM, and 7PM on 24 December at the Level 24 sky lobby. Rejoice in merry tidings of the spirit of holidays with the long-standing tradition of celebrating the anticipated holy mass on 24 and 31 December at 8PM, Level 7 Ballroom. Experience Whimsical Winterland for your holiday adventures at Marco Polo Ortigas Manila. To know more about the hotel, visit www.marcopolohotels.com. Make reservations at (+632) 720 7777. Follow the Hotel in Facebook at facebook.com/MarcoPoloOrtigasManila or @MarcoPoloManila on Twitter or Instagram.